Includes Change 1, Effective 1/8/18. This book is organized using the FAA’s three distinct types of aviation weather information: observations, analyses, and forecasts. Within this construct and with the support of full-color illustrations throughout, AC 00-45H1 explains U.S. aviation weather products and services. 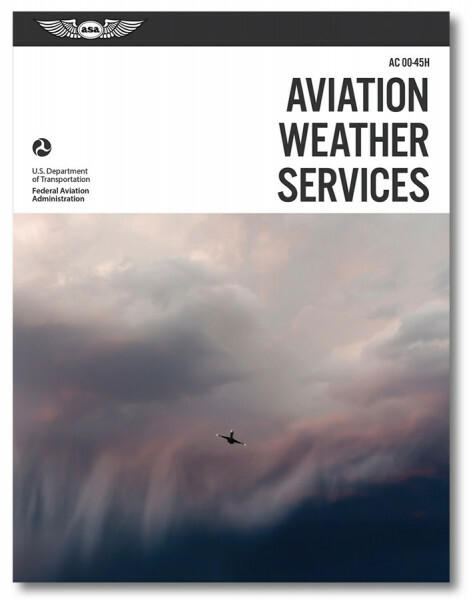 This Aviation Weather Services thoroughly explains the many U.S. aviation weather products and services available to pilots. Weather product examples and explanations are taken primarily from the Aviation Weather Center’s Aviation Digital Data Service website. The AC provides hundreds of weather website addresses for weather resources and definitions.